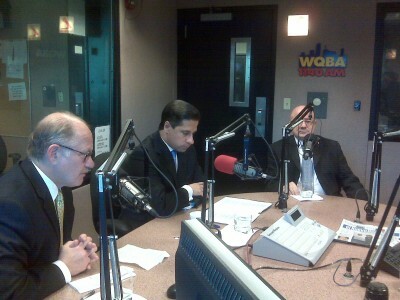 FIU President Mark B. Rosenberg, Superintendent of Miami-Dade County Public Schools Alberto Carvalho and Miami-Dade College President Eduardo Padrón were on the WQBA 1140 AM radio show “Pedaleando Con Bernie” on Monday, Jan. 4, to discuss education funding priorities for the coming year. Their participation on the show, hosted by veteran journalist Bernadette Pardo, was a prelude to a town hall meeting that will be held at Florida International University on Feb. 24 at 5 p.m. in the Wertheim Performing Arts Center. In the second gathering of its kind, the three educational leaders will discuss the future course of education in South Florida. Monday’s radio show kicked off a weekly series on WQBA leading up to the town hall meeting. The town hall meeting, which is sponsored by Univision Radio, will be broadcast live in Spanish on WQBA. Simultaneous English translation will be provided at the event. I would like to know how to English-speaking educators get the information on these very "elitist" or discrimnatory talks. This is the second time that as an a doctoral candidate from the College of Education I am made to feel that I am not privy to these discussions. I voiced my opinion the last time to a Ms Santana from FIU and never received a reply – that, by the way, is the culture of the University Dr. Rosenberg! Ms. Ferreira, as a result of your interest and that of other members of the university community, we are making sure that we secure interpretation services for the upcoming town hall meeting, which will be on our campus next month. I hope you are able to join us and participate in the discussion.